I have three finishes to show. I'm on a roll! The first is a little table topper. It's an oldie but goodie, lol. 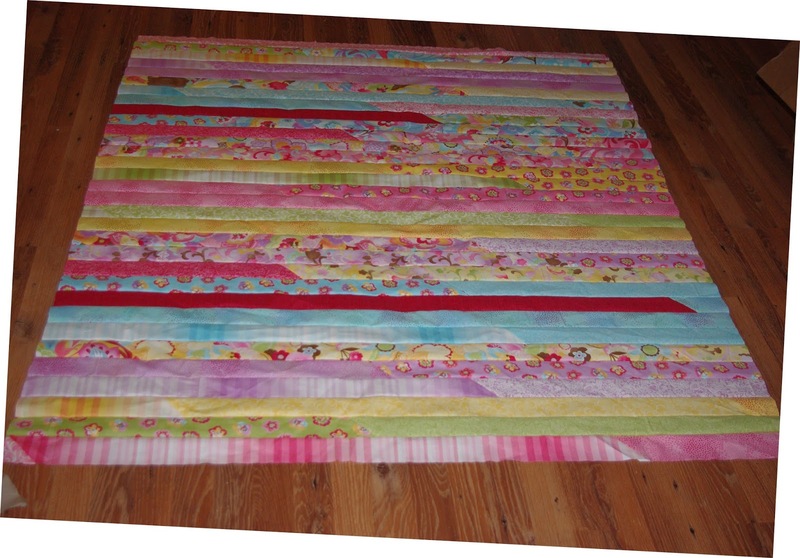 This is a mini twister quilt made with scraps. I made it for my step-mother-in-law a long time ago and I finally bound it up. This is the first time I ever used single binding. 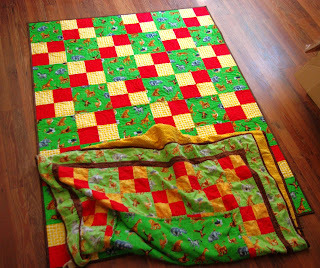 It was pretty easy, but I had never used single binding because I always make bigger quilts that need the double fold. I really don't like making table toppers because I don't really use them. I'm not much of a decorator, lol. 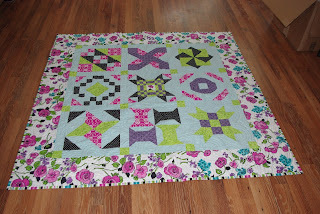 This next one is a sampler I made in a beginners quilting class that I made a friend go to. This last one is another oldie. I have no idea when I made this one, lol. It's been hanging out in my wardrobe for a while. I had quilted straight lines through the 9 patches and then I decided to go ahead and quilt swirls over the entire quilt. 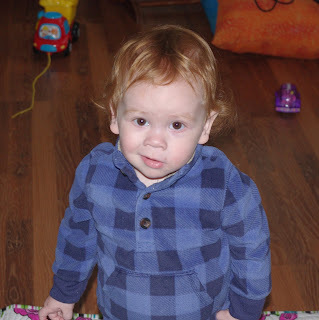 Oakley isn't quite sure about all this quilty stuff, but he hammed it up for the camera, lol. 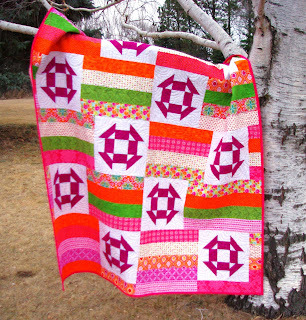 Hope you're all having a quilty day! I finished the binding on another quilt last night. That's four finishes this month! I'm on a roll. It's a Chihuahua magnet, lol. On another note, I re-potted my lucky bamboo plant. The bigger shoots were in the same container as the smaller one on the right. I don't keep it here in the direct sunlight. I just put them here for the picture. They really don't like too much light. These are little shoots off of my brother's big plant. 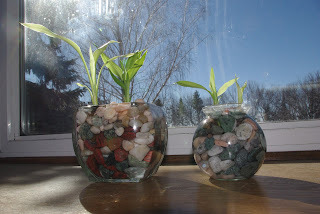 I like them, and the bigger one has grown quite a bit since we got them, so I decided it needed a bigger container. 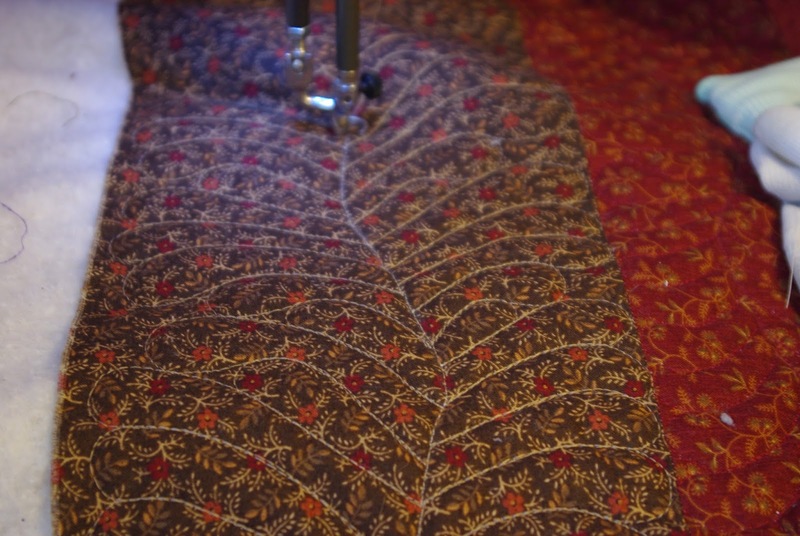 Hope you have a quilty day. 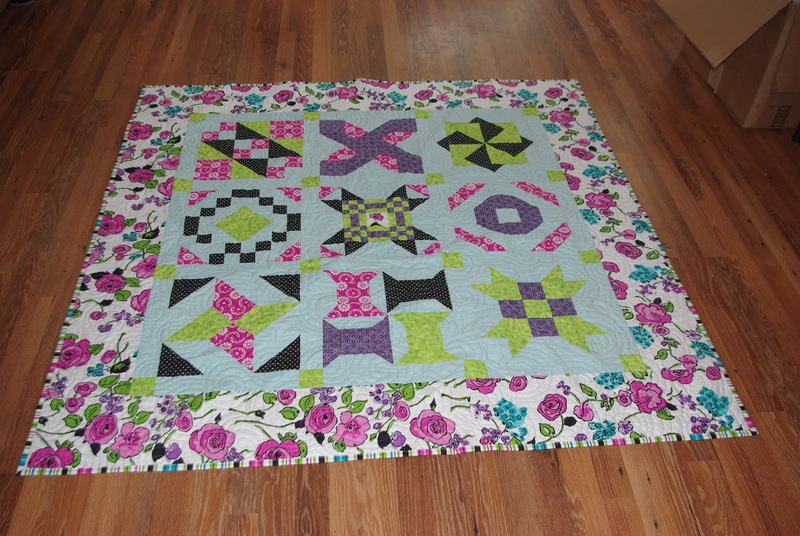 I finished another quilt this afternoon. That's three old UFOs crossed off my list! This is just a panel with a couple of borders added, but it's finished! 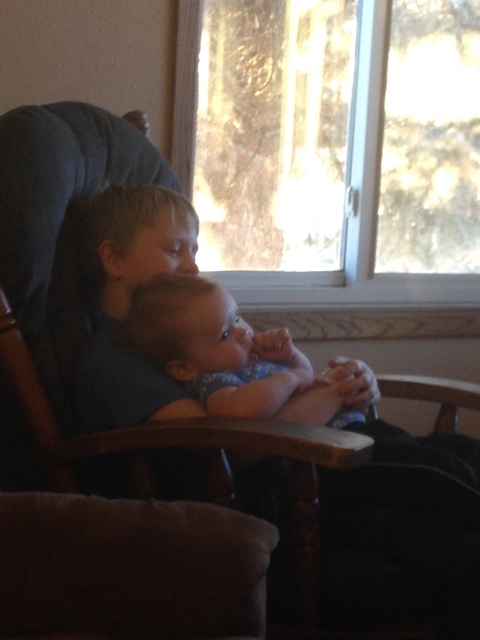 On a side note, I've decided that babysitting is a less expensive alternative to having a baby brother. My two younger kiddos have had so much fun with Oakley! 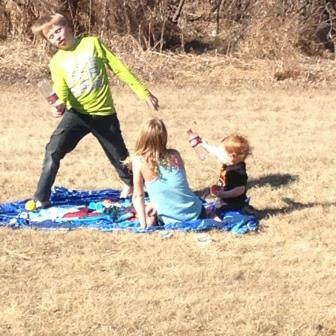 They were playing outside without coats on March 9th in North Dakota! 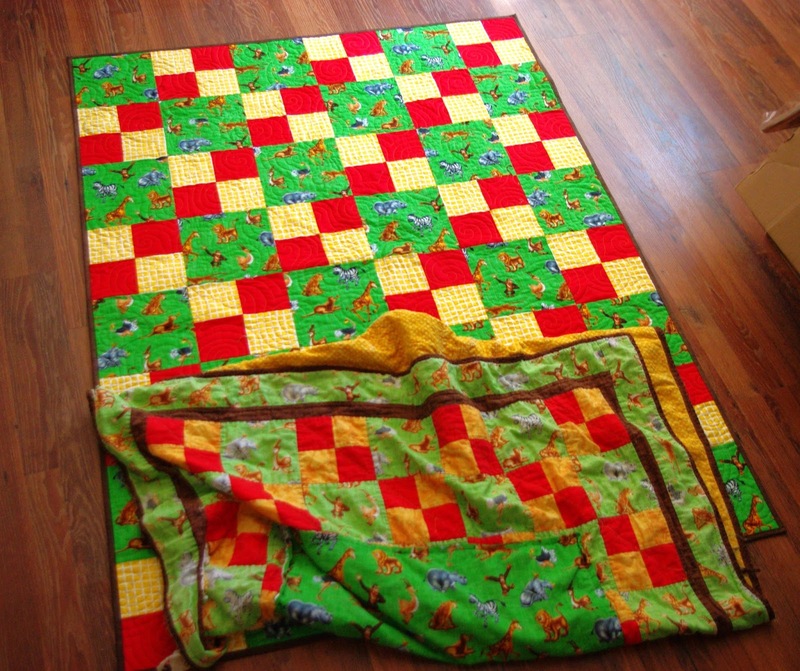 I finished the binding on two quilts yesterday. The first quilt is a mile a minute quilt. I don't remember the name of the fabric line. 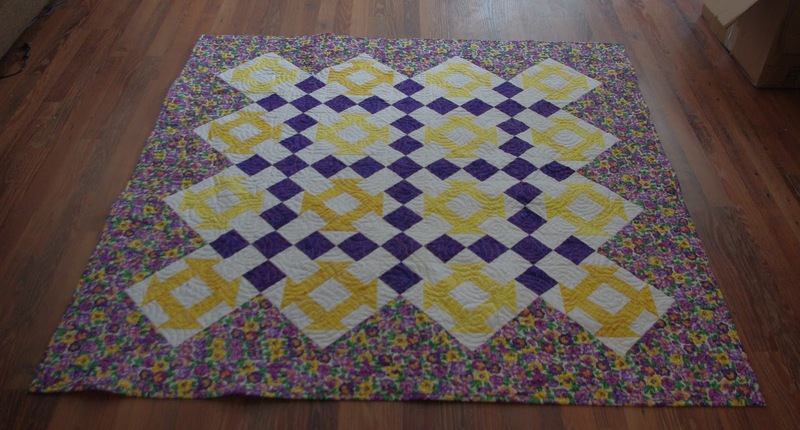 The second quilt was from a kit and the top has been finished for about two or three years. So glad to get a few old UFOs finished! 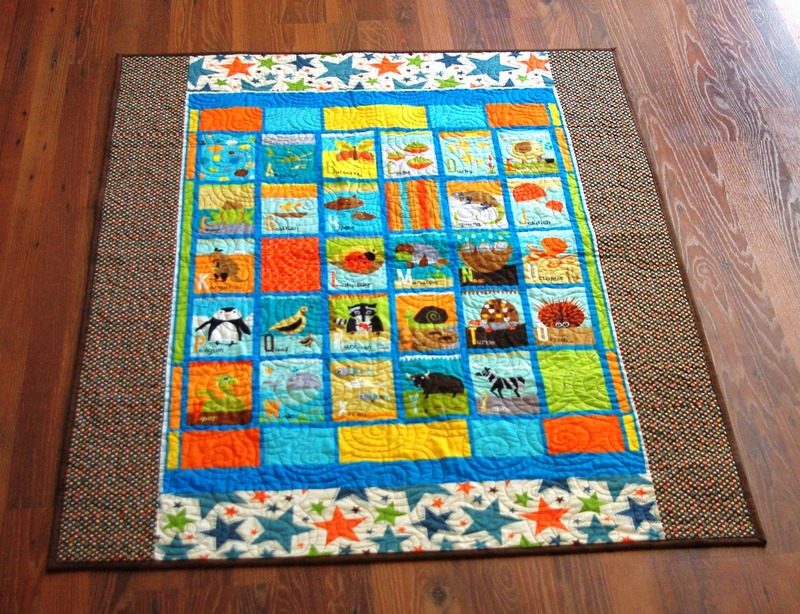 Hope you have a quilty day! On my design wall today are blocks from my brown monochromatic quilt. I wish I could say that this quilt will make a dent in my brown fabric, but it won't, lol. The yellow one and purple one did, but I have TONS of brown, so alas. I'm linking up with Judy. Make sure you check out what everyone else is up to! I finished off four quilts yesterday and I made my first fabric purchase in a LONG time. 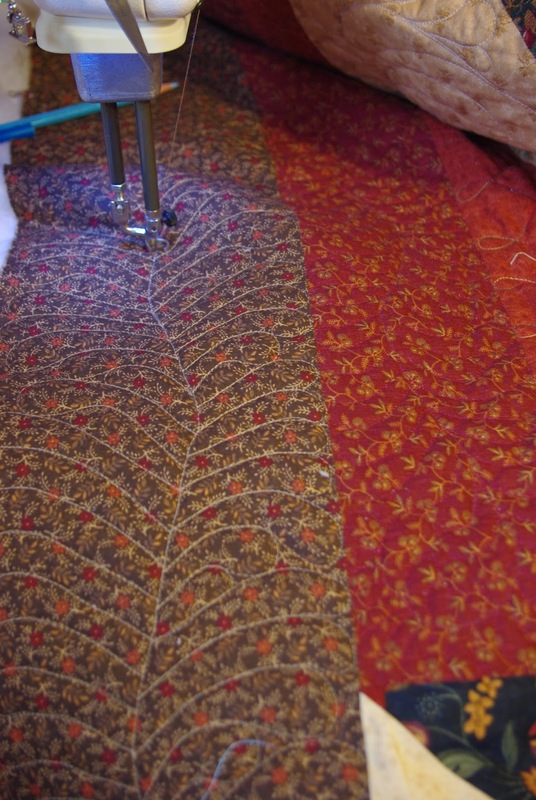 In the morning, I helped someone attach the binding to her quilt. I had provided the backing and the binding, so that was almost 3 yards. 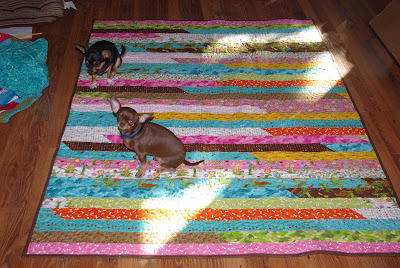 I finished up the quilts that my two kidos (10 and 11 years old) finished. Those came totally from my stash. 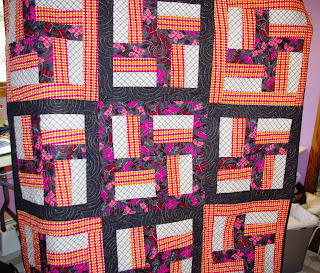 One quilt used about 5.7 yards and one used 4.6 yards. The backing and binding of the last quilt used 1.8 yards. If you'd like to see pictures of these quilts, click here. The fabric I purchased was for backing and it was 50% off. Yeah me! I'm linking up with Judy. 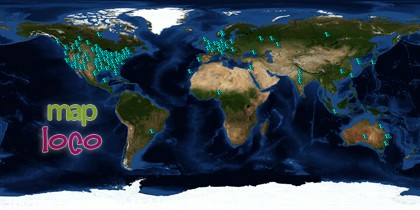 Check out how others are doing! I finished up three quilts today! YEAH ME! 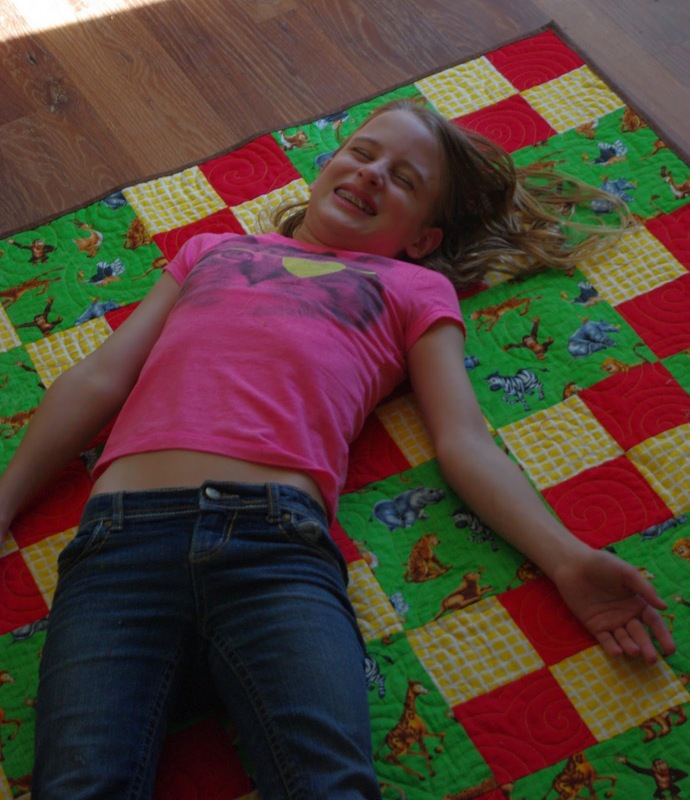 The first was a quilt that my daughter Mariah made. This is her first quilt. She pieced it, and I quilted and bound it. 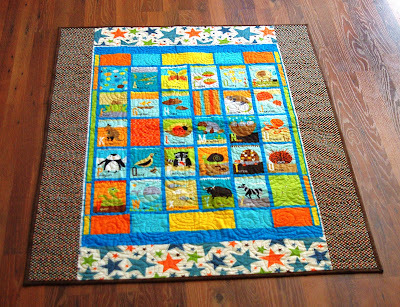 It was made to replace the quilt that I made her when she was a baby which is, of course, much loved. You can see that I had to patch the old quilt, lol. Next, I finished the quilt that Josiah had pieced. He's pretty proud, I'd say, lol. Here is a close-up of the quilting. Lastly, I finished an old UFO. This is a quilt that my oldest daughter, Olivia pieced a long time ago. 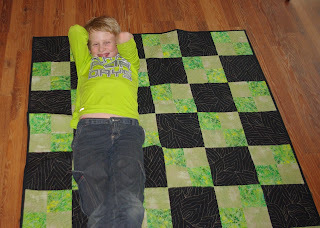 Three quilts finished in a day! I'd say that constitutes a pretty good quilty day! On my design wall this morning are two floppies that I finished yesterday. The first one is my violet monochromatic quilt. I used The Boardwalk Block tutorial from 13 Spools. Be sure and check out her website for lots of great information! It's REALLY purple, lol. I'm glad that I didn't have enough of the dark purple and I decided to go with the different colored centers. Although, looking at it now, I realize that it might have been cute. The different centers are some of the myriad of different solids that I have, so in addition to using up quite a bit of the purple I had in my stash, I used up some solids as well. After the quilt was finished, I ended up with all these scraps. Not sure what to do with them, but they're fun! Any suggestions? 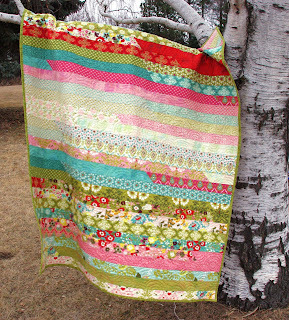 After I finished this one yesterday afternoon, I was bored and saw a jelly roll pack that I had sitting around opened. 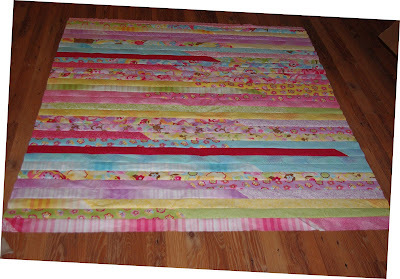 I decided to make a a quick Jelly Roll Race quilt. I don't remember what line it's from because it was out of the package and had been sitting around my studio for a while opened. I was afraid it would get messed up, so I decided to see how long it would take me to get it done. It was quick, lol...just a few hours. I'm linking with Judy at Patchwork Times. Make sure and check out what everyone else is doing! 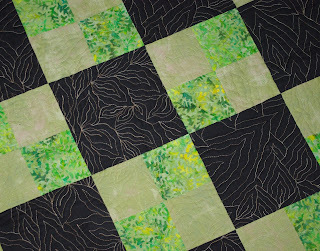 Today, I'm planning on basting two quilts that I need to finish by Saturday. 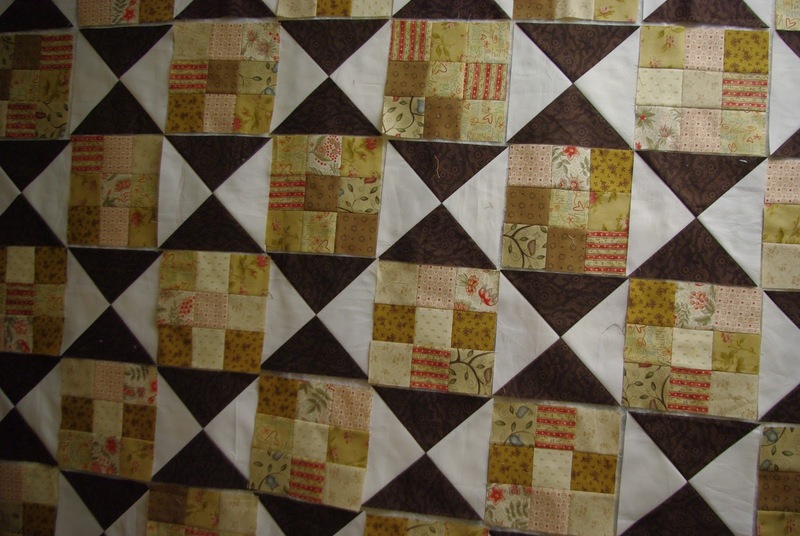 Hope you have a quilty day! I have big plans for this week. 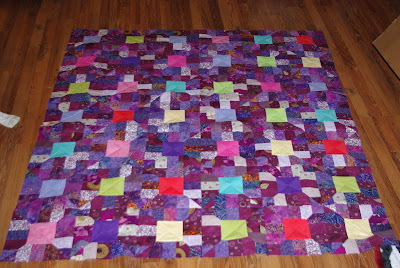 First of all, I have several quilts that just need binding to finish up. I have two quilt that are almost quilted. 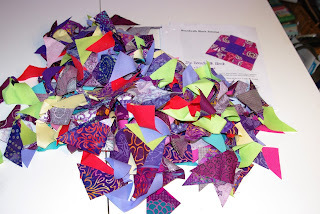 And, I want to start on my Monochromatic quilt...which I have decided may be two different quilts, lol. Let's see how much I get done! Today, I have a little visitor. He's the grandson of my husband's cousin, lol. 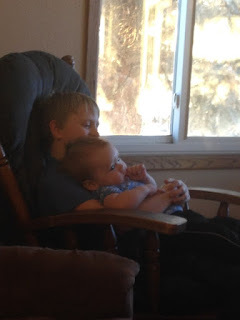 I think my son likes having a "little brother" for the day. I've been working on the borders of my mom's quilt. There are two thick borders and I'm doing feathers in them. My feathers don't look that nice up close, but on the bed, they don't look too bad, lol. Hope you're having a quilty day! Family Practice physician married to a wonderful guy. 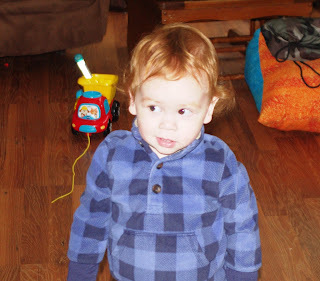 Now I'm a Stay-at-Home mom which is the greatest job of all. 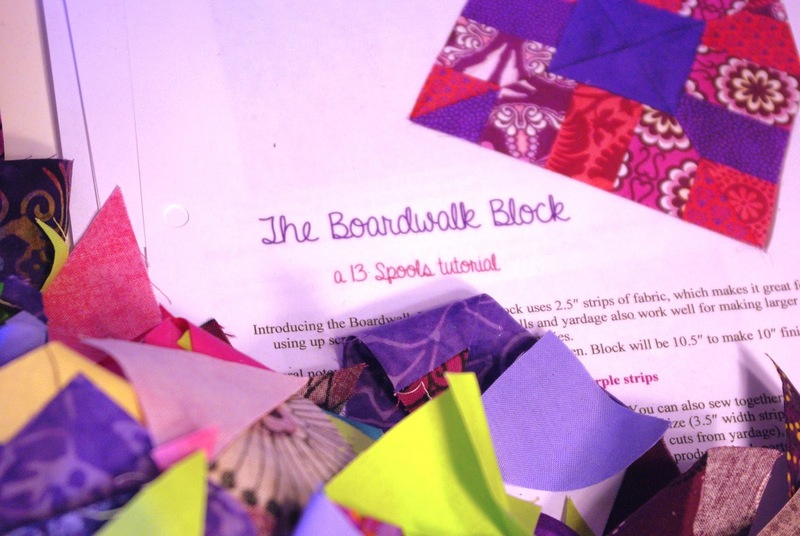 Feel free to e-mail me with quilting questions or just to say HI! Content copyright © Tamera Svanes. Awesome Inc. theme. Powered by Blogger.